Russian ice hockey players have brought the NHL trophy to Russia for the ninth time, showcasing the Cup to crowds at home. It is a tradition in the NHL for every player on the Stanley Cup-winning team to take the trophy to his hometown for one day. 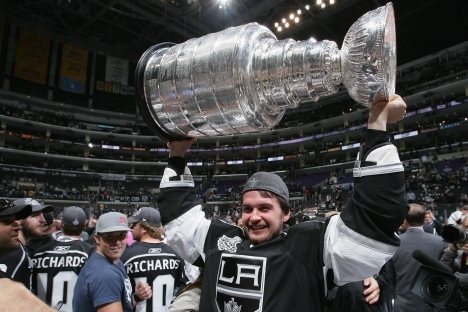 When the Los Angeles Kings won their first Stanley Cup last June after beating the New Jersey Devils in the finals, two Russian players for the team – defenseman Slava Voynov and center Andrei Loktionov – went to Russia to showcase the Cup in their hometown. Ilya Bryzgalov:"I have to prove myself every day"
In early July, the Stanley Cup visited Voynov’s hometown of Chelyabinsk, making the Urals city the first stop in the Stanley Cup’s busy summer tour. On its journey, the Cup will visit four countries, 13 U.S. states and five Canadian provinces. The tour finishes on Sept. 19. The trophy was displayed in the Tractor youth hockey school early in the morning on July 4. The line of people eager to have their pictures taken with the Cup stretched across the entire street. The Stanley Cup spent just two hours on ice in Chelyabinsk. Later that evening, it made another stop in Russia – this time in Voskresensk, hometown of Andrei Loktionov. “The Cup first came to Voskresensk in 1997, when Detroit’s Igor Larionov and Slava Kozlov won the Stanley Cup. It was brought here five years later, when Detroit won the Cup again. Ten years have passed, and the trophy is back with a new winner, Andrei Loktionov of the Los Angeles Kings,” said Phil Pritchard, Vice President of Hockey Operations at the Hockey Hall of Fame. Loktionov was awarded a badge of honor for his services to the city and the district, and his first coaches were given certificates of merit. The following day, the Cup was taken to Voskresensk’s manufacturing companies before leaving Russia. It was the Stanley Cup’s ninth visit to Russia, but the first time in two years. There were no Russian players on the winning teams in the 2009/2010 and 2010/2011 seasons. The Cup first came to Russia on Aug. 16, 1997, when Vyacheslav Fetisov, Igor Larionov and Vyacheslav Kozlov of the Detroit Red Wings took the trophy to Moscow and Voskresensk. Yekaterinburg became the next Russian city to bask in the glory of the Stanley Cup. Once again, it was thanks to the efforts of a Red Wings’ player. On July 15, 2002, residents of the Urals city caught a glimpse of the trophy. The Cup made regular appearances in Russia from 2003 to 2009. In 2004, Tampa Bay Lightning forward Dmitry Afanasenkov brought the trophy to Archangelsk, where the visit drew an incredible crowd. Omsk became another city to enjoy the North American trophy when Oleg Tverdovsky, who won the Stanley Cup with the Carolina Hurricanes in 2006, brought the Cup to the city where he had played. Tolyatti’s Ilya Bryzgalov contributed to the Anaheim Mighty Ducks victory over the Ottawa Senators in the 2007 finals. Bryzgalov brought the trophy to the home of the Lada on Aug. 6 that year. Yekaterinburg got the chance to see the prize a second time, on Aug. 11, 2008, after Pavel Datsyuk’s helped Detroit win the Stanley Cup once again. Incidentally, Tyumen hockey fans were also able to catch a glimpse of the Stanley Cup, as Datsyuk brought it there after visiting his native Yekaterinburg. The hockey-mad city of Magnitogorsk welcomed the Stanley Cup for the first time on Sept. 1, 2009, traditionally known in Russia as the Day of Knowledge. It was brought to the city by Evgeni Malkin of the Pittsburgh Penguins. The trophy that travels around the globe is a replica of the original Stanley Cup. The replica is awarded to the winning team following the final game of the series. The original Cup remains at the Hockey Hall of Fame in Toronto – the winners are only allowed to touch it. This combined report is based on reporting by Chelyabinsk regional television, R-Sport.ru website and MegaFon Sport magazine.